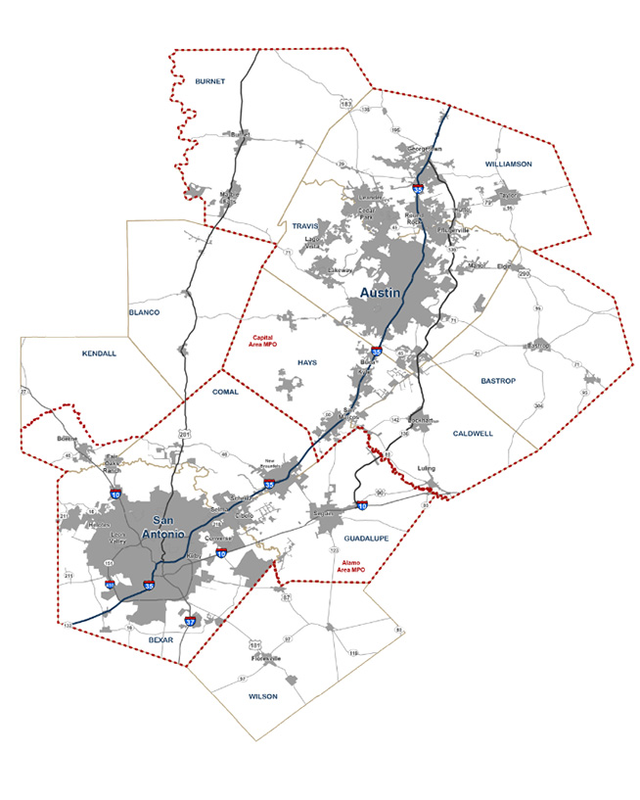 The Capital-Alamo Connections Study is a joint effort between TxDOT, the Capital Area MPO (CAMPO), and the Alamo Area MPO (AAMPO) to develop a strategy for mobility improvements within the greater Austin-San Antonio region. The study area encompasses a 12-county region including Bastrop, Bexar, Burnet, Caldwell, Comal, Guadalupe, Hays, Kendall, Travis, and Williamson counties which are represented by both MPOs, and Blanco and Wilson counties which are outside the MPO boundaries. A multimodal approach is needed to manage congestion and improve overall mobility between the Austin and San Antonio regions. Population growth in and between Austin and San Antonio is expected to increase in the coming years, leading to an increase in congestion and travel delay. The I-35 corridor is the main connector between Austin and San Antonio, but opportunities to expand or improve I-35 are limited. For this reason, the study will consider possible solutions in addition to adding capacity to I-35. The purpose of this connection study is to develop a regional transportation strategy for enhancing mobility through infrastructure, policy, and technology solutions for the greater Austin-San Antonio region. The intended outcome of the study is a broad regional strategy for mobility improvements including infrastructure, policy, and technology solutions. These solutions will be organized into short and long-term timeframes for implementation. Below are several resources with additional information about the study, including documents, exhibits shared at past meetings and workshops.